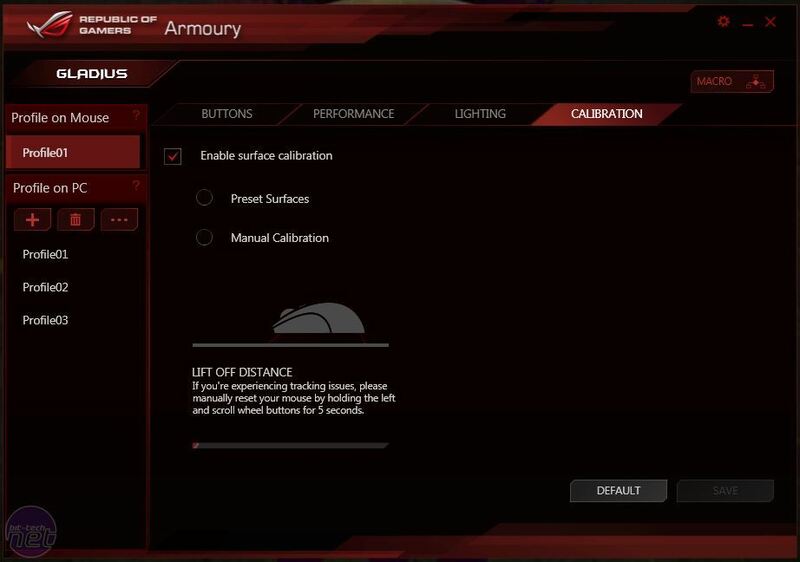 To get the most from your Gladius, you'll need the latest version of the ROG Armoury interface, which allows you to customise button configurations, performance options and the onboard lighting. It is Windows only at the moment, but Asus says Mac OS X support is also coming some time in Q4 2014. The software automatically detects the firmware of your Gladius and updates it if needs be. 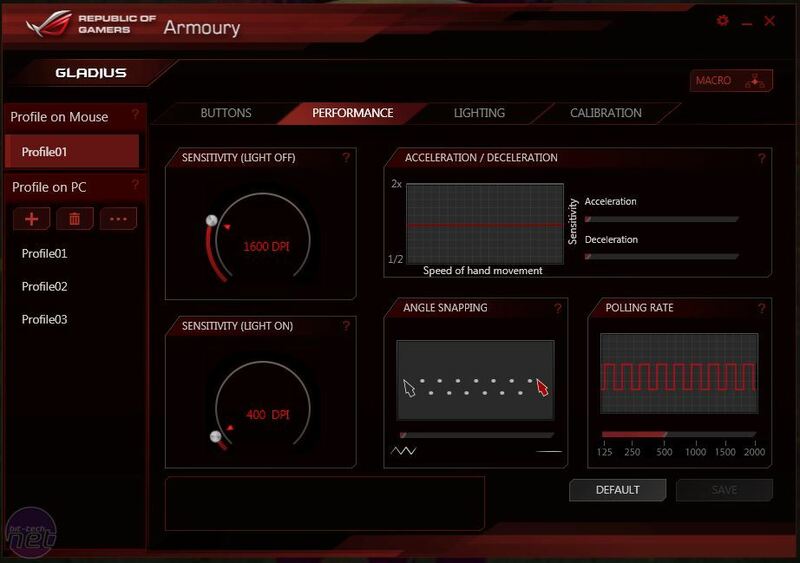 Like most such solutions, ROG Armoury is built around the concept of profiles. 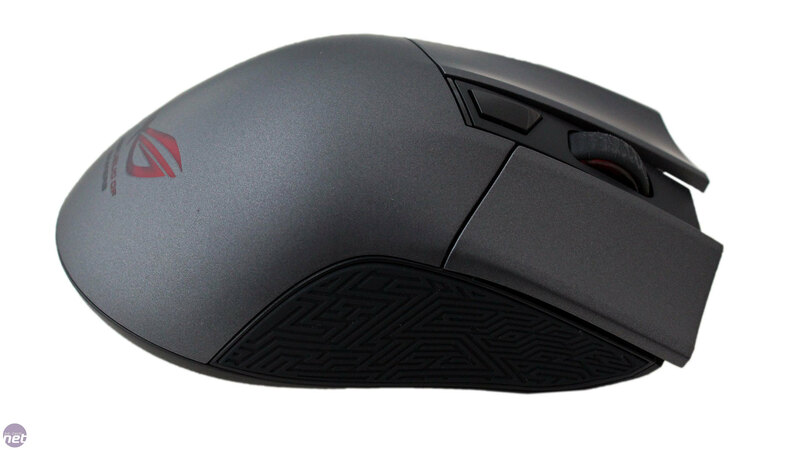 The Gladius's built-in flash memory only allows you to save a single profile to the mouse at a time and, while you can create unlimited profiles to store on your PC, there's no automatic, application-based profile switching. This means you'll have to open the software and apply a new profile manually every time you want to swap. One advantage of this is that the software doesn't need to be running all the time. Also, FPS control schemes are normally very similar, if not identical, so one profile should be broadly applicable. However, if you're the sort that would like to be able to switch profiles quickly in game, the Gladius isn't for you. 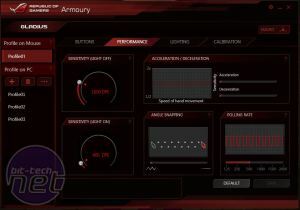 While ROG Armoury may not be as comprehensive as other software solutions, it is fantastically intuitive, and also quick, as settings are applied within a second or two. Every single setting is within quick reach, and it's immediately clear what everything does. Your profile list is always visible, allowing you to quickly switch the profile you're editing and to see and change the profile currently loaded to the mouse with a simple drag and drop. Profiles (and macros) can also be imported, so sharing your settings or using others' is possible too. 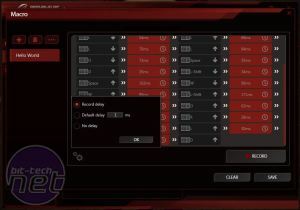 The Buttons screen lets you assign functions to any of the six programmable buttons, though as both scroll commands can also be customised, users can configure eight actions in total. 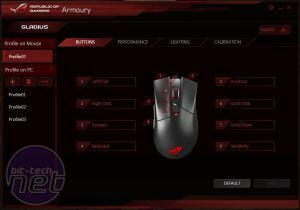 The standard mouse functions can be remapped, with double click, scroll left and scroll right also available, as well as the option to disable any button. Some basic Windows functions (close applications, show desktop, cut, copy, paste and undo) are available, as well as all the usual multimedia ones. Finally, you can assign any of your pre-recorded macros (there's no on-the-fly recording available). There's no option to bind a button as a shortcut to a file or folder, though with only six buttons this isn't likely to be an issue. The Performance tab features dual sensitivity sliders that allow you to configure the two DPI levels between 50 and 6,400 DPI in 50 DPI increments. 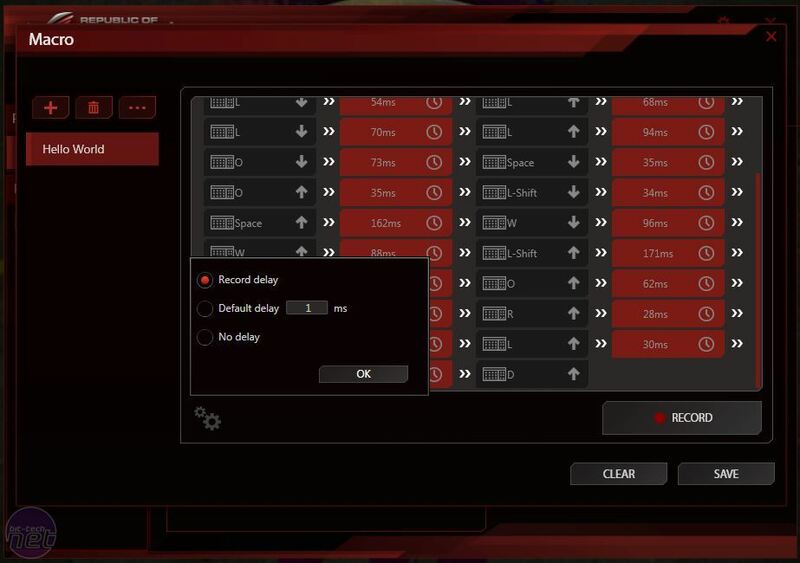 Asus clearly has in mind the idea of a sniper button here, with one normal sensitivity level complemented by a quickly accessible lower one for precise aiming. There's also an acceleration, deceleration, angle snapping and polling rate options with handy graphs and images that indicate the impact a certain setting will have. 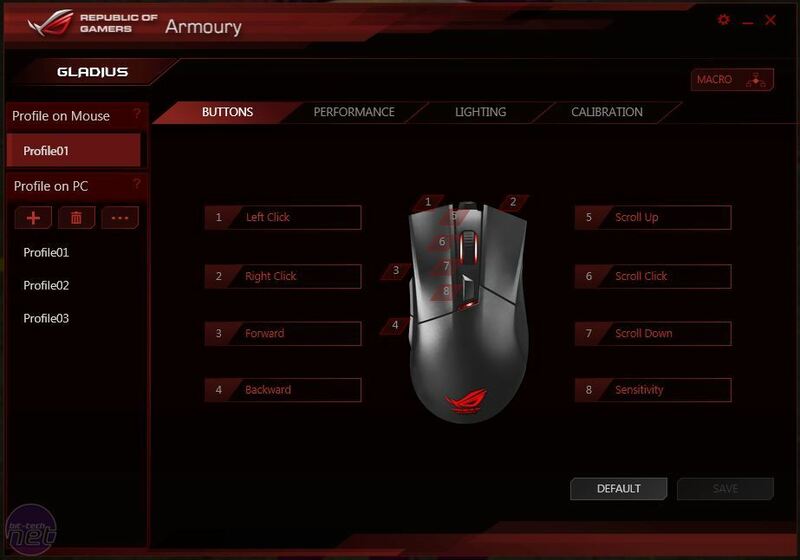 The Gladius is lit in three areas: the ROG logo at the rear, the thin DPI light just behind the DPI button and the scroll wheel. All glow red, and can be enabled or disabled in the Lighting tab according to preference. The logo can also be set to a breathing or constant light. With a palm grip, the DPI button will be mostly blocked out, but it's strong enough to leave a glow on your middle finger, and seeing it at a glance is less important with only two settings available, as you're likely to be aware of what setting you're currently on (it lights up for one, turns off for the other). Macro recording is pretty simple, and the recorder will track mouse commands too, excluding the DPI button. You can set it to record delays as they are, set a constant delay or have none at all, and editing commands or delays is as simple as double clicking the relevant one. There are no advanced playback options or timer commands, but it still covers the needs of most mouse-bound macros. Tracking was smooth across a range of DPI levels, with no observed acceleration or jitter – this is a very nice sensor to use both in game and in general desktop use. As an optical sensor, it is somewhat picky with its surfaces, but providing you have a mouse pad you'll be fine. This does mean it's not great as an on-the-go mouse, however. On a wooden desk surface, for example, tracking was far worse, and though the software's manual calibration tool did help, it didn't change the fact that laser-based mice are the best bet if you'll be using them without a mouse pad with any regularity. 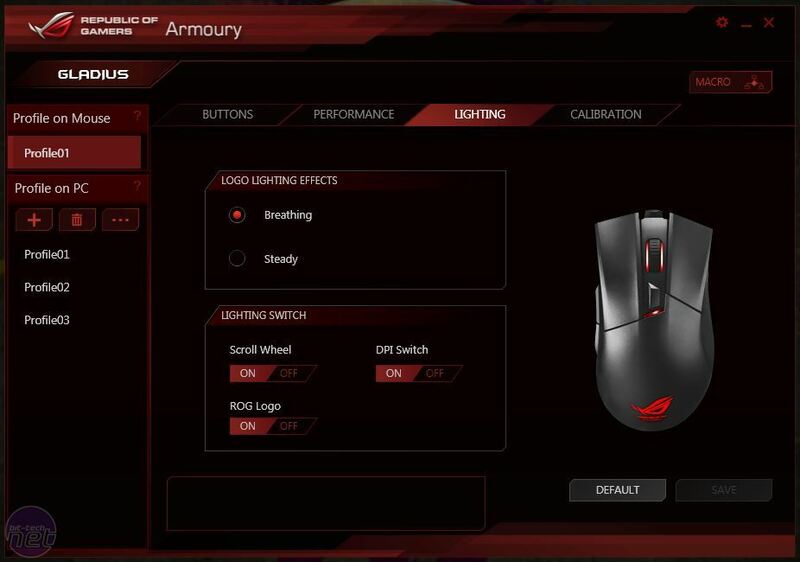 The Asus ROG Gladius is a well built, comfortable mouse that tracks smoothly and ships with extremely easy to use software that enables some handy sensitivity and function customisations. 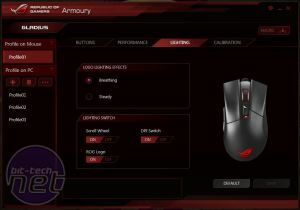 That said, you might have expected more customisation for your money; the Roccat Kone XTD, for example, which is also very comfortable, has many more programmable functions, multiple onboard profiles with automatic, application-based switching also available, more DPI levels and weight adjustment, costs £5 less, and other cheaper mice also offer more in certain areas too. 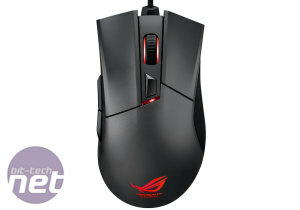 However, that doesn't prevent the ROG Gladius from being a good mouse. 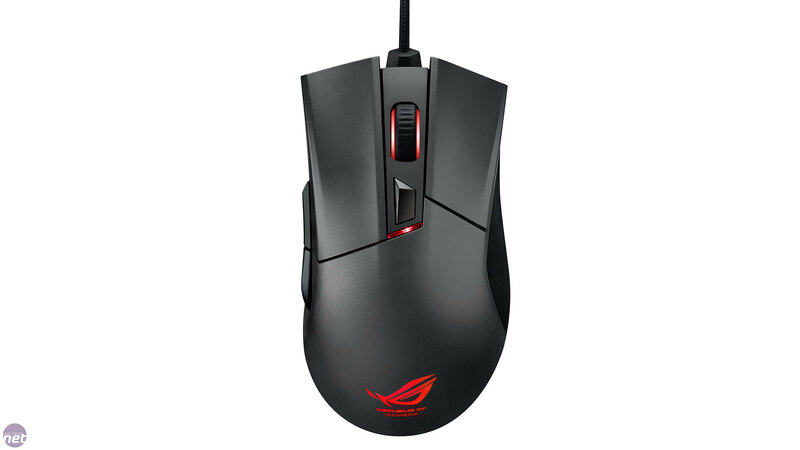 Asus's focus has been on hardware, rather than software, and while the price premium certainly trades at least in part on the ROG brand, it's not entirely unjustified – the replaceable Omron switches (and the bundled second set), ALPS encoder, detachable cables and replacement feet as well as the overall build quality are all indicative of a mouse that's built to last. Also, the customisations that are available are well suited to the target audience, FPS players, who are less likely to need more than one readily available profile or two DPI levels. If you do, however, the Kone XTD is a fine choice. The Gladius, meanwhile, retails at the maximum we'd ever want to pay for it, so the lack of extra fine-tuning stops it getting our top-grade award, but it still comes recommended if it meets your needs and you're willing and able to make the investment.